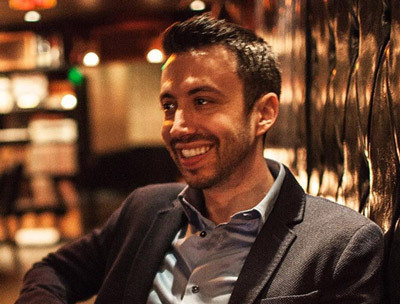 I am happy to announce that my long-time friend and business partner, Matt Blancarte, has unleashed a new design for his personal blog, Matt Blancarte dot Com. I have known Matt since we were juniors in high school, so it is cool to see his new brand materialize online. Matt has been working with UBD since its August 2007 inception, but he has been blogging since July of 2007. 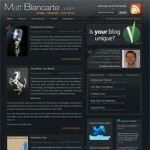 Matt’s blog focuses mostly on design, business, and personal development. Matt just posted a detailed write-up on the process and functionality behind his new design. In addition to being UBD’s lead designer, Matt will be speaking on the “Blog Design Makeover” this year at IZEA Fest, a convention for bloggers and online advertisers. IZEA Fest will be held on September 11-13, 2008 in Orlando, Florida. In addition to speaking at the event, UBD will also be exhibiting at the event with a booth. Several other well-known bloggers will be speaking at the event including Jeremy Schoemaker, Loren Feldman of 1938 Media, John Chow, Neil Patel and Michael Brito, among many other famous faces. Head on over to Matt’s blog and let him know what you think of the new design. Congratulations on the new redesign, Matt! Slick new design that showcases your considerable talents! Congrats! Awesome design! I’m usually not a fan of dark themes, but this one pops. Cool, very cool. Shall tell Matt too. Very smart theme, i really like dark backgrounds with light text, i dont think there is enough of that around. That is an awesome design. Thanks for highlighting this. I’ll actually be in the market soon for a new blog design! The new design looks awesome! When I am ready for a blog design I am going to be using your services. @Andrew – Thanks for the compliments. @InternetAge – We look forward to working with you. Thanks, everyone. Matt has a lot of cool articles on his blog. You should check it out. Thanks, Nate for plugging my new design! @ Matt Blancarte – 4TW. I especially like that Twitter image. Your design looks very slick. nate – thanks for the mention. Looking forward to meeting you guys. Your blog looks awesome by the way. You guys have some good blog designs amoungst yourselves. Oh yeah, i am bit late for expressing my feelings on Matt’ blog, new design, It’s such a wonderful, but i think, IMO, there is more amount of darkness, some times it’s stretches eyes, otherwise it’s a wonderful one, Congrats to Matt and UBD. Seems everyone loves Matt’s design…You’re talented designer Matt. This is a very good design. It was a bit slow loading for me however. Probably just my connection. How many different blogs do you guys do each month. You seem to feature only a few but I have seen your brand quite a bit on the web. wow, the black colour looks so great! Its so cool, but my blog is Blogger..
Nice blog design. Very clean!